Egyptian Castle Investments is a leading trading company working in the import and export field, providing high end services and facilities for distributors, manufacturers and dealers. The company has a strong presence in the region since 1997 and operates in Egypt, the UAE and East Africa and has established key partnerships and banking relationships throughout. The company has deep experience trading in global markets such as Europe, North America, and South East Asia, the Middle East and Africa as well as working with leading governments in several African countries. 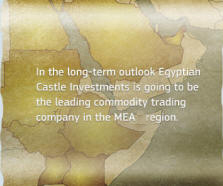 Shipping over 1 million metric tons of a range of commodities each year, Egyptian Castle Investments’ main trading products are bitumen, cement, fertilizers, steel, food supplies and various industrial products.